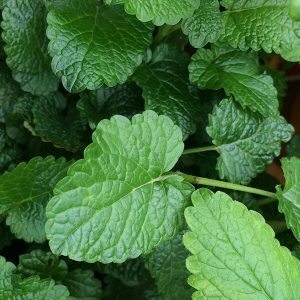 Related to mint and with a similar appearance Melissa officinalis is commonly known as Lemon Balm and often simply Balm. It is easy to grow from seedlings in the home garden. This is a herb that has been used for 1000s of years and as the common name suggests is used as a calming herb. The essential oils are extracted by distillation and then mixed with a carrier oil to create the balm. Melissa officinalis ‘Lime’ – More of a lime fragrance. Melissa officinalis ‘Quedlinburger Niederliegende’ which is said to have a higher oil content. Melissa officinalis ‘variegata’ – Variegated foliage. In a frost free area Melissa officinalis or Lemon Balm is very easy to grow. You can plant seedlings in spring, or start plants off from seed in winter indoors. This is a plant likes a well drained humus rich soil. It grows well in full sun to part shade and plants need to plated at around 30 cm (12 inches) apart. Good drainage is essential, although watering during very dry summers will be required. The plant does spread by underground runners and we suggest growing Lemon Balm in containers to control its spread. An annual tidy up by pruning back in early spring will keep the plant growing well and promote a bushy habit.